JAMMU, Aug 10: On the eve of World Sanskrit Day, Bawa Kailakh Dev Parbandhak Committee and Shri Kailakh Jyotish Avim Vedic Sansthan Trust organized a cultural festival and seminar. Objective of the programme was to give a massage to the young generation to work for the development of the Sanskrit language and to preserve the national heritage. On this occasion, former Vice Chancellor and Principle of Rashtriya Sanskrit Sansthan Deemed University Kot Bhalwal, Prof R Devanathan was the chief guest. He emphasized on the development and learning of Sanskrit language. “Sanskrit language is the mother of all language; various scientific researches have its origin from the roots of our ancient Sanskrit books and Vedas,” he said. 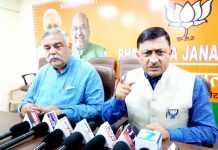 The president of the Trust, Mahant Rohit Shastri and Brahman Sabha president Shakti Dutt Sharma appealed that all the parents should teach their children Sanskrit language and also dedicate some personal time for its development. On the occasion, a big number of medicinal plants and trees were planted in the Bawa Kailakh Dev Asthan premises. Dr C M Raina, Rampaul Seth, Sarpanch Raj Dev, Yash Seth, Janak Singh, Surinder Singh, Rajat Soodan and many other Sanskrit scholars were also present on the occasion.